Fave bloggers Katherine Power and Hillary Kerr of Who What Wear posted an inspiring video blog Monday regarding what key pieces will help update a current wardrobe for this season. Bloomingdales sponsored the video, which showcased a fabulous leopard coat by Aqua, and knee high boots. Using Katherine and Hillary's suggestions, I thought I would add a few more items to the list. An earlier blog of mine details all of the top trends for fall, but it is not always reasonable to stock your wardrobe with ALL of the trends of the season. There are a few fool proof items that you can buy each Fall which will help bring your current wardrobe up to speed. Invest each season in a new coat that can be worn for a multitude of occasions. 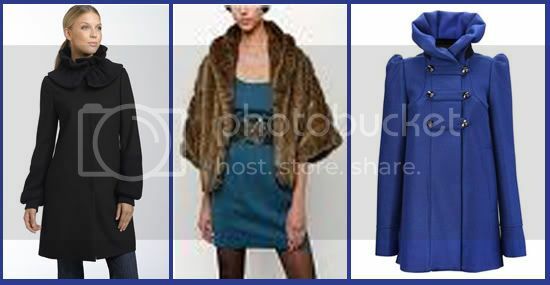 The above options are all unique choices that incorporate a trend of the season. Option 1 is a classic shape with a ruffle collar that adds interest. Option 2 is a more daring choice, which incorporates the fur trend of the season. Option 3 is a bold color that is sure to turn heads. As mentioned in a previous post, boots are THE footwear of choice this fall. Pick your favorite style and make them your main investment for the season. Choose a pair that stands out in some way, be it detailing, shape, color or fabrics. Make your boots the focal point of your outfit. Each season pant trends change - maybe it is the fit (hello skinny jeans! ), or maybe it is the fabric. Any of the above pants incorporates a key trend of the season. Topping my list is a pair of perfectly fitted leather pants. If leather isn't for you, try uber-luxurious fabric - velvet. Another favorite pant for fall is the harem pant - although don't expect to see me sporting them around town. An easy update, a new bag can add a little flare to your wardrobe. This season make it speak with a sequin bag, which is a great way to incorporate the sequin trend into your existing wardrobe.